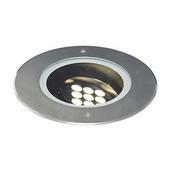 Inground uplight with variable beam direction.316L stainless steel bezel and powder coated aluminium housing. - Comparable performance to 70W HQI.Integral driver and pre-wired with 1 metre of rubber insulated cable. - Honeycombe accessory included for optional increased glare control. - Static load test to 2000kg and therefore suitable for vehicular and pedestrian traffic. - LED lifespan L70 60,000 hours.